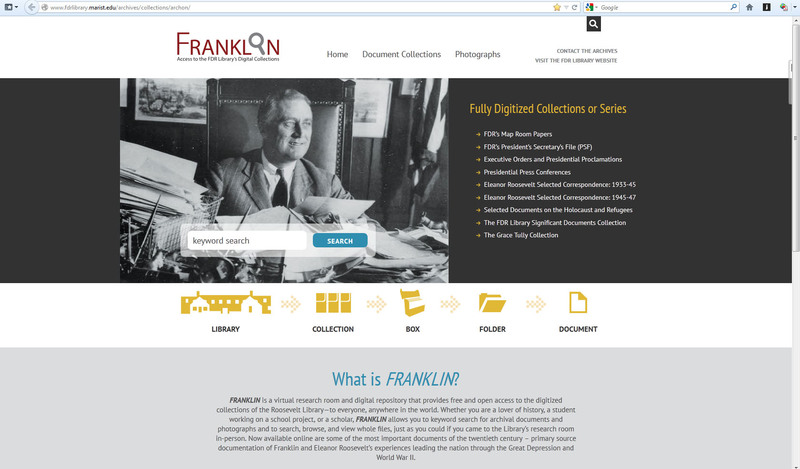 On December 4, 2013, the Franklin D. Roosevelt Presidential Library launched FRANKLIN. What is FRANKLIN you ask? FRANKLIN is a virtual research room and digital repository that provides free and open access to the digitized collections of the Roosevelt Library – to everyone, anywhere in the world. Whether you are a lover of history, a student working on a school project, or an experienced scholar and author, FRANKLIN opens a door to some of the most significant and in-demand historical materials our Library has to offer. Now you can search by keyword, browse through photograph galleries and document lists, and for the first time open whole folders of archival documents online – a level of discovery that till now was only possible in-person. Many of the most important documents of the twentieth century are now available for you to view on FRANKLIN – from your living room, classroom, office or dorm room. With this initial launch, FRANKLIN makes 350,000 documents and 2,000 public domain photographs available to you now. And we will be adding even more digitized content in the months and years to come. FRANKLIN is the result of a special cooperative effort — a unique combination of public, nonprofit, and corporate support. The Roosevelt Library and its parent agency, the National Archives, worked with nonprofit partner the Roosevelt Institute to digitize a large amount of microfilmed archival documents. The Library’s digital partner and web host, Marist College, then developed and implemented FRANKLIN’s underlying database infrastructure based on the Archon platform. Marist runs the system using powerful servers manufactured by Marist and Roosevelt Library corporate partner, IBM. So go to the Roosevelt Library’s website www.fdrlibrary.marist.edu to start exploring FRANKLIN today!